Company of One: Why Staying Small Is the Next Big Thing for Business, by Paul Jarvis. Company of One is your official guide to building around the idea that staying small and avoiding growth can be more durable and even more enjoyable than business as usual from author Paul Jarvis. Get it for your favorite device. I also write the Sunday Dispatches weekly newsletter (since 2012), sharing my full-length articles on business, life and creativity. Something went wrong, give it another go. A company of one is simply a business that questions growth. A company of one resists and questions some forms of traditional growth, not on principle, but because growth isn’t always the most beneficial or financially viable move. It can be a small business owner or a small group of founders. Employees, executive leaders, board members, and corporate leaders who want to work with more autonomy and self-sufciency can adopt the principles of a company of one as well. In fact, if big businesses want to keep their brightest minds in their employ, they should look to adopt some of the principles of companies of one. I’ve personally seen the most success in my life when I’ve figured out solutions to problems without having to do what traditional businesses do to solve problems — hire more people, throw more money at the problem, or build complex infrastructures to support the extra employees. Basically, I’m not interested in addressing problems by throwing “more” at them. Solving with “more” means more complexity, more costs, more responsibilities, and typically more expenses. More is generally the easiest answer, but not the smartest. I’ve found both delight and financial benefits in working out solutions to problems without growing. Instead, I and many others enjoy handling problems with the resources currently available. Although it can require a little more ingenuity, solving problems this way can set a business up for long-term stability, since less is needed to keep it afloat. Here’s what people are saying about Company of One. Ever since starting MailChimp 18 years ago, I’ve always been told that my way was wrong. My way has never been to “be big.” My way was always to “be useful.” My company has become a global brand with millions of customers, over $525 million in annual revenue, and almost 1000 employees united by a single mission to help companies of one and entrepreneurs. Go figure. There’s not one, right way. Only your way. Paul’s book, Company of One, can help you find your way. Company of One will give you invaluable insights to focus on the purposeful, interesting, and impactful work you actually love doing, right alongside permission to stop blindly chasing growth by defining success on your own terms. This book is great for freelancers, side-hustlers, and small business owners who are looking to bring autonomy, self-reliance, and creativity to their work without becoming total workaholics. Your business can thrive with less! 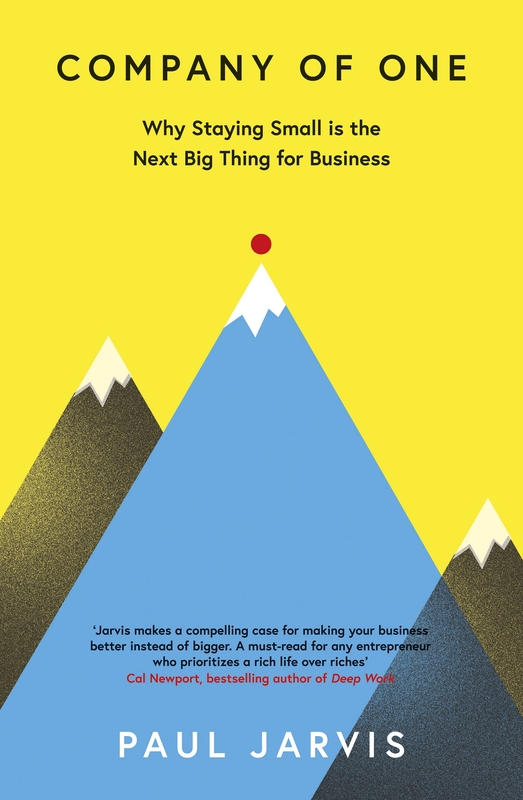 Company of One is a riveting, lucidly written guide to run a successful minimalist business. Growth has been hacked to simply mean “more”. More revenue, more customers, more employees, more products, more, more, more. That’s a tragically myopic view of growth. Paul Jarvis will help you open your eyes to a broader, wiser definition of growth. One of learning, one of betterment, one of contentment. There’s never been a more opportune time to launch or run companies that embrace having and being “enough”. The most important ingredient is a new worldview. Company of One can give you just that. Paul Jarvis is a writer & designer who’s had his own company of one for the past two decades. Paul has worked with professional athletes like Steve Nash and Shaquille O’Neal, corporate giants like Microsoft and Mercedes-Benz, and entrepreneurs with online empires like Danielle LaPorte and Marie Forleo. Currently he teaches popular online courses, hosts several podcasts and develops small but mighty software solutions.